I’m back from Japan! It was – as expected – totally amazing. I’m still on comedown. It’s a bit overwhelming thinking of all the things we saw and did, but luckily I wrote a daily travelog out there to remind myself. 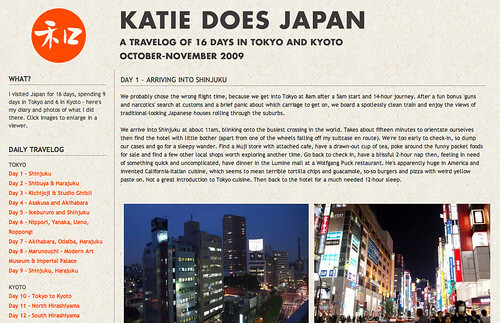 I’ve just cobbled it all together into a website, so click onto katiedoesjapan09.blogspot.com if you want to have a look. I’m also slowly adding all my photos to Flickr – there are a LOT of them and I still have ten rolls of film to develop, too. I’m so happy with my E-P1, I love how all my digital photos turned out. Hi Hannah, glad you like the site! Prices are similar to UK in general, there are cheaper stores and more expensive ones – Japanese chain stores like Muji and Uniqlo are a bit cheaper, so I did some stocking up! Wow. Loving your blog. And the Japan pics! I've just finished a Murakami book which always leaves me GAGGING to go. Maybe next year.Your Japan blog will be really useful. Thanks! Ah! I really wanted to go to Japan, but now you've fueled my desire even more! Great photos & details. Wow, you scored big time in Japan, love all your fabulous finds.